Strangers are merely friends we have yet to meet . . . . .
What a busy and interesting couple of weeks I have had, first there was the trip away with my trainee chefs, judging at the South Island Salon Culinaire and this week I have had the great pleasure of sharing my kitchen and table with new friends. Sometime ago I was contacted by Mervyn from North Carolina about my Wildfood's column. We have been emailing each other back and forth since, and he and his family decided to make New Zealand their summer vacation spot. They have been touring New Zealand this last week and finally made it to Greymouth and I met them at the train station. After joining me for lunch, they headed south for the night to take in the spectacular Fox and Franz Josef Glaciers and a helicopter trip onto them. They came back the next day and joined me for dinner. So as to give them a taste of New Zealand, I put together the following menu using only ingredients that had been caught, shot, gathered, grown for or by me. My deepest thanks to Kylie for going out and getting me the wild goat. My apologies Mervyn for not having huhu grubs in time to try . . . they did arrive on my doorstep the next afternoon! A big thank you also for the real corn grits and adding to my recipe book collection . . . I look forward to getting into the kitchen and giving them all a go. .anyone that dines has to sign the table. Who will be next I wonder? I had already decided on the making the famous Australasian dessert for them; Pavlova, when here at HUB-UK, we also received a request for a meringue recipe. So this week's recipe is dedicated to my new friends: Mervyn, Gena, Sari (Sue-lee misses you!) and Aubree of North Carolina and also to Marsha C who requested the meringue recipe. Believe it or not there are many types of the humble meringue so join me over the next few weeks, when I will be covering all the different types. So hang tight Marsha, try Pavlova this week and all the other meringues will be forth coming! Pavlova for those of you that have never come across it before is somewhere between a meringue and marshmallow, it has that crisp meringue shell and yet has a soft marshmallow type centre. Controversy always reigns down here as to whether it is an Australian or New Zealand creation / dessert . . . and it is always big news when an older recipe for it is discovered; next to rugby I think it's the biggest inter-country rivalry or start of an argument between the Australians and Kiwis. What is known is that it was created and named for Anna Pavlova a ballerina. 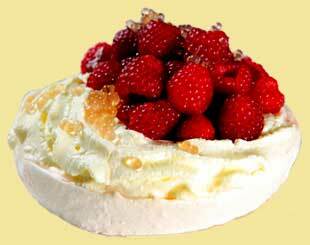 There are many recipes for Pav (as it is known here in the Antipodes), this is my favourite. The taller / thicker the Pavlova the better, as this ensures a creamier centre: about 15cm tall is ideal. Enjoy your Pavlova and bon appetit . . . . .